Flower Pot painting with Jess! Come out and join us for an afternoon of painting flowerpots and sipping your favorite wine and beer. For this class you will get to select a word of significance from a provided list. 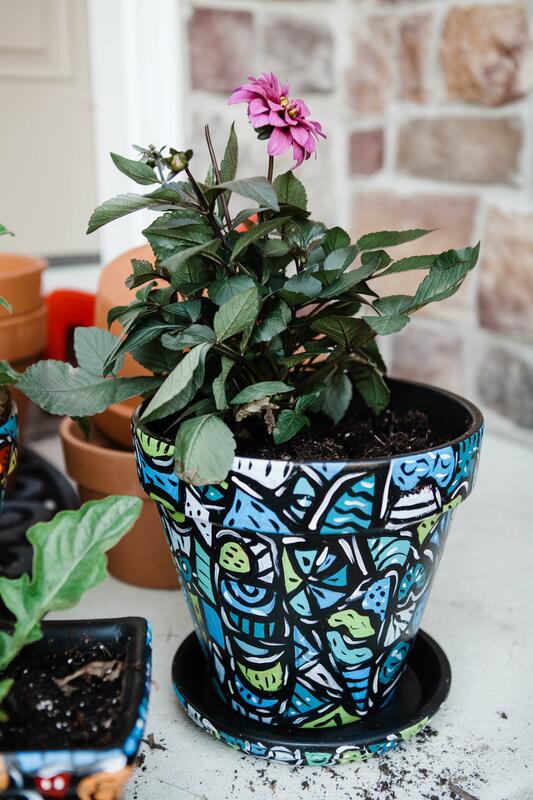 On your flowerpot, Jessica will create a design around the word you chose. The flowerpot then becomes like a custom made three demential coloring page. Instead of coloring in a coloring book, you get to paint in your design with the color scheme of your choice. No matter what word you select each piece will be one of a kind, just like you and or that special someone you are making it for. After all……Mother’s Day is right around the corner! Please check out Jessica’s process page on her website: www.letitbepots.com and Instagram @letitbepots more ideas and to better understand her concept and process. Words to choose from: love, kind, grateful, mom, bloom, grow, strength, abundance – Please purchase your ticket for the word you would like to paint.